Repeating Crossbow is a Weapon in Dark Souls 3. It is part of The Ringed City. 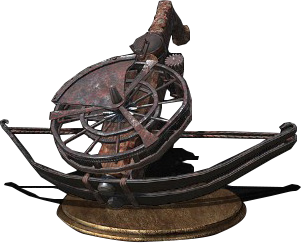 This crossbow, customized for repeat-firing to face mobs alone, was wielded by Slave Knight Gael. Used in the battles of an endless journey, this crossbow is covered with twists and dinks, rusted with blood, and made extremely brittle from overuse. Assume stance to activate repeat firing mechanism, and repeat fire with normal and strong attacks. Has the lowest durability among all crossbows. With the exception of the Light Crossbow, Avelyn and the Knight's Crossbow (which are the low-weight, multi-hit, and split damage counterparts respectively), the Repeating Crossbow is outclassed in attack rating by every Crossbow. Worst crossbow ever, 10 shots for no damage. Regret using slab on this. I imagine this was built and WA designed not to use FP which would offset it&apos;s negatives. Someone from F.S said "this is kind of fun and tactically useful. Welp, nerf it." We can&apos;t have Boss weapons any where near as cool as the Bosses themselves I guess. 20 dex? if i my stats its not compatible with this weapon i cannot use the repeating skill? THE IDEAL WEAPON FOR MY GUTS RUN! YUS! This or the avelyn for pvp? Despite all this weapon&apos;s hate, I just can&apos;t it down. Currently using it in my left hand instead of a shield as a simple poke tool, not really as a damage dealer. As a crossbow, it does low damage (only barely stronger then the light crossbow) but has low stamina consumption. It does have low durability but this isn&apos;t really a problem because most stages can be done without it breaking and repair powder is quite easy to obtain. It is heavy however, tied for the heaviest available, and it has some notable stat requirements. These are notable weaknesses and is something to consider. The light crossbow has similar stats offensively, is easier to obtain and is much lighter, but I think the repeating crossbow has a much better WA (I guess being compared to tackle, that isn&apos;t saying much). As stated below, it&apos;s weapon art is situational but can really prove itself useful if used sparingly but effectively. Exploding bolts, if manually aimed toward the opponents feet will create multiple "firebomb" like explosions that are hard to dodge and can be a great way to close a duel. Keep in mind that they do low damage. It&apos;s more then a throwing knife, but should still be used when an opponent is greatly damaged. The WA itself has quite a slow startup and when facing players, is easily telegraphed. It can be formidable at close range with splintering bolts however, and can stagger opponents with ease. I have found that lightning bolts have helped me a lot in PvE, and do respectable damage (unless the enemy is resistant to lightning, then use explosive bolts). In the end, it all comes down to mastering the weapon art, otherwise I find it hard to recommend this weapon. I picked it up because I like the weapon design and heard all the hate about it, and thought I&apos;d try it myself. Now it is honestly one of my favorite weapons. It&apos;d be nice if you could use the WA whilst one-handing, the trade-off being that it can only store one kind of bolt. Would make it much less obvious if you do the WA. Funfact, the stance you&apos;re given when holding the weapon art button is IDENTICAL to the Aquamarine Dagger stance (minus the fact that you hold the crossbow UPWARD instead of at your side, like the dagger), which is also identical to the Darkwraith walking animation. Add info: it fires 10 consecutive bolts with its weapon art although they spread a lot like a cone shape and most of them probably gonna miss unless your target is at melee range and each one deals significantly less damage than a single bolt fired with the regular attack. A bit of advice, don&apos;t waste a single upgrade material for it.... I mean has anyone found any usefulness for this weapon? It seems weak, slow, brittle, consumes a massive amount of bolts that you constantly demands you to farm souls to buy them. And its weapon art will most likely get you killed in pvp trying to reload it. Honestly i haven&apos;t found a single pro to this weapon apart from being funny. For being a weapon from the last boss of the series and one of the toughest, it sure is disappointing. Man if crossbows had scaling, this thing would&apos;ve been a beast with its weapon art. it just flies upward at a 30 degree and misses pretty much all the arrows (used at range). We could have had a darl miracle that fire those red orbs or those blue lightning, a pyromancy that create Gael&apos;s cape but nooooo, we have had this piece of junk. They should have given us Gael&apos;s Sick Cape instead of this hunk o&apos; junk. I want to slap some fashion sense into people.